A group of women sitting outside Costa coffee look shocked. They’re turning around to see who is screaming at the top of their voice, disturbing their quiet lunch. I would look around, too, but I’m incapable of turning — or stopping for that matter. I also know exactly who is disturbing the peace — it’s me, hurtling through the shopping centre, gathering speed, narrowly missing pensioners and office-workers on their break. In truth, I’m probably barely hitting 10mph, but that’s how it feels on this hare-brained contraption called the Air Wheel — a kind of electric unicycle. This new must-have has been flying off the shelves at Harrods, has sold out at various outlets online and is, apparently, going to transform the way we travel. A bit like a Segway, this little machine is designed to help us zip around town at up to 14mph, but crucially doesn’t have the handlebars of its counterpart. With nothing to hold on to, mastering the Air Wheel is far from easy. Yet the promotional videos show people whizzing through their office reception area or flying along city streets on their wheel, holding a coffee. They’ve sold 300,000 of the Chinese-made machines since the launch last year. Walking, it seems, is so last century. Unfortunately, I don’t have a good track record of being in charge of wheels. When I tried riding a bike for the first time in years, I went flying off after hitting a pothole. I am such a nervous driver that, despite having passed my test 20 years ago, I still won’t go on the motorway. Yet here I am on a wheel, with no brakes, no steering column and no safety belt. My adventure began at the company’s base in Basingstoke, Hampshire, where the team showed me the ropes. The makers say you can get the basics in a couple of hours, and be proficient in a day or two. You turn it on via a button on the wheel. The idea is that you stand your feet on two pedals either side of the wheel and simply lean forward to move, back to stop and left and right to turn. Sounds simple — but it isn’t. Just getting on is impossible. It’s so unstable, I need to lean on Fabio, one of the Air Wheel team. The instructions suggest leaning against a wall at the beginning, but I find a handsome Italian man always works better. And when I say lean, I mean cling on for dear life. Even though the pedals are only three inches off the ground, I am terrified. I feel as wobbly as you’d expect from a novice on an electric scooter . Balancing seems impossible and for half an hour I do more squealing than a teenage girl at a Justin Bieber concert. After mastering standing on the Air Wheel, the next ‘step’ is to start moving for a respectable distance. A tiny tilt forward and it starts to move. The more you press the faster it goes. I feel like I’m four years old when Mum took the stabilisers off my bike — I’m trundling along but I just want to get off. Fabio and his friend hold on to me, on either side, as they try to move down the path. I keep shrieking and they keep telling me to ‘relax’. I feel so scared that I keep jumping off. The trick, apparently, is to stand straight and look in the direction you’re going in — but I keep looking at my feet, which makes me wobble. Finally, after 20 minutes, the boys lighten their grip and, bit by bit, I find that I’m doing it on my own . . . it feels thrilling, fast, and dare I say it fun. I get confident enough to up the speed — the faster you go the more steady you feel, like a bike. The cold air is rushing through my hair and actually, I love it. There is only one problem: stopping. You’re supposed to be able to slow down enough that you simply step off and grab hold of the wheel before it falls but going slowly means wobbling, so I panic and jump off instead. As for turning, the theory is you simply lean in whatever direction you want to go, but every time I try, I panic and jump off. Fabio tells me it can take a few days to get the hang of that, so for now the Air Wheel and I will be going in a straight line only. Fabio boasts he regularly goes shopping on his Air Wheel and even navigates the London Underground on it. Inspired by his claims, I decide to give the Air Wheel a go on a busy pedestrianised street. There are people, and benches, and broken glass, and I am on edge. There are shop windows to bang into, signs to knock over, children to injure. Fortunately, those in my path are all taking one look at me and stepping far away. And you do get looks on this thing. A bloke munching on a sausage roll says: ‘You’re not gonna lose any weight on that, are you?’ Charming. I’d turn and mow him down, but I don’t know how. I’m like a beginner on a ski slope: I cannot move out of your way, so you’ve got to move out of mine. 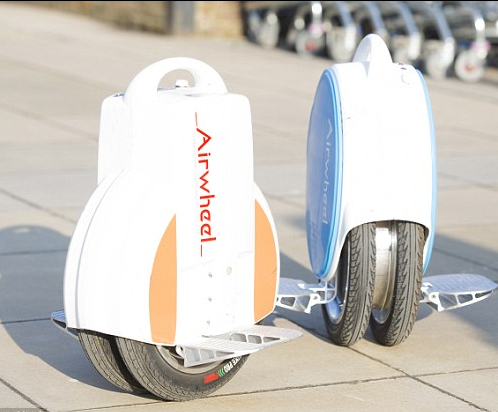 The Air Wheel will travel up to 24 miles on one charge. And although at 13kg (28lb), it feels like carrying a very heavy brick, it’s about the same weight as a fold-up bike. The makers say people are buying them for dog walking, shop runs and days out. Their youngest user is ten and their eldest is 70. Seventy! Meanwhile, the gadget is getting rave reviews online and I can see why. It’s fun, fast and will get you places quicker than your feet can. But I, for one, will be keeping my feet on solid ground.